I know, I know. Everyone is talking about rain. But, please. It barely sprinkled in Poetry or in Terrell this morning. 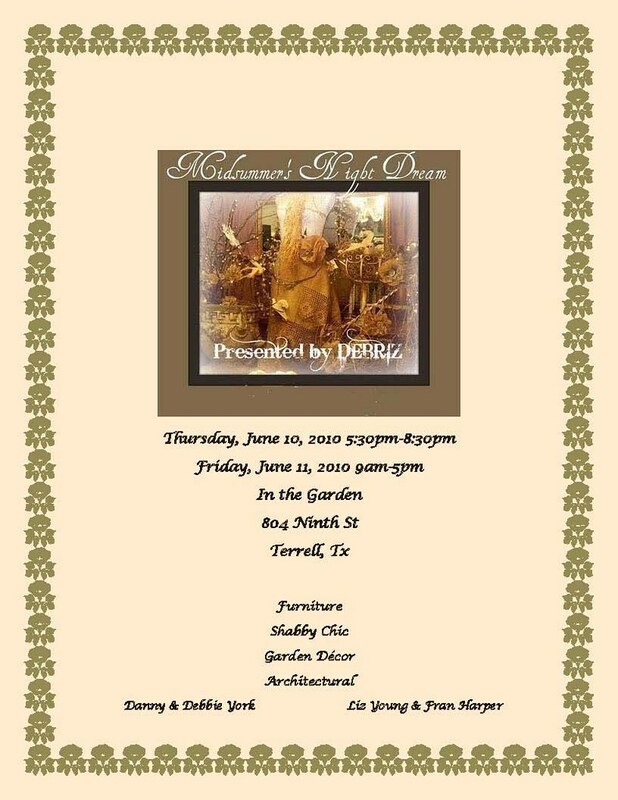 I believe I mentioned that Liz & Fran and Debbie & Cat Daddy are holding a home show in Terrell, didn't I? Well, hello? It's still going on tomorrow (Friday). Getcher self there! That back yard is large, and treed and cool and canopied. You will find bottled water and great stuff from 9 to 5. You can make a day of it, really. Not 5 minutes from 804 Ninth Street is 107 N. Blanche St. A nice little store called jRne is at that location. And then about 10 minutes away is 19026 FM 986, the home of Primitiques inside Jack's Town & Country. Your gps should be told that all addresses are in Terrell. It will guide you around like it knows what it's doing. Why not enjoy a day of shopping in Terrell? I'll be at 9th Street in the morning and then I'll swing by Primitiques real quick. Hope to see you! I went this evening and got some good stuff. Everyone should go! I didn't make it to Judy Hill's because Mabank flooded, but we are all good now! If I were close, I'd come visit you. Hope you have a good sale. Man are you a busy one! Sounds like Texas is booming with great goods! Wish I lived close to grab some of those goodies! It's always so much fun to read your blog Mindy. I so wanted to go to those sales, but I'm babysitting my beautiful little granddaughter this week, hope I get to see alot of pictures from the 2 sales!!! I think it would be fun to go see Debbie, Danny, Liz and Fran, then hit Jrne, then land in Primitiques... load up with all kinds of good stuff - then try to figure out where to put it all. Why oh why am I missin' all the good stuff?!!? You are sooooo busy, but I love all your creativeness and wish I lived close enough to drink margaritas and have junkin fun. Love the file cabinet!! I know, I got there early and things were already snagged and tagged! I got a screen, some table legs for Josh and some cool plant stands. A blogger emailed me wanting info about the stores in Terrell, I blog about, so I sent her your way! I was working with Judy and let me tell you....it rained and rained and rained some more!! But, folks still came to her sale. Lots going on the last few days! Hope all your sales were really good! Have a great weekend! Relocation Sale Now in Progress! Dress Up Party this Saturday! Spelling Bees make me Smile!